Illustration shows how an electrode was used to stimulate the cingulum bundle. Courtesy of American Society of Clinical Investigation. 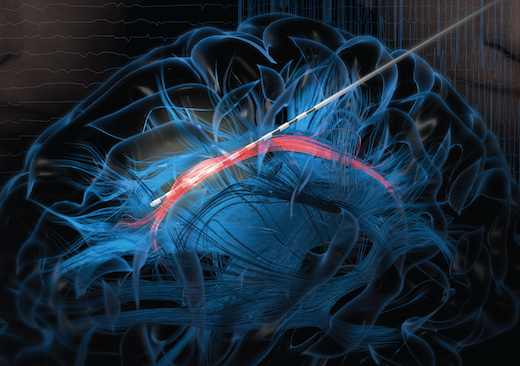 Emory neurosurgeons see the technique as a “potentially transformative” way to calm some patients during awake brain surgery, even for people who are not especially anxious. For optimal protection of critical brain functions during surgery, patients may need to be awake and not sedated, so that doctors can talk with them, assess their language skills, and detect impairments that may arise from resection. Lying under the cortex and curving around the midbrain, the cingulum bundle has a shape resembling a girdle or belt – hence its Latin name. The area that was a key to laughter and relaxation lies at the top and front of the bundle. The bundle is a logical target because of its many connections among brain regions coordinating complex emotional responses, Willie says. The research was supported by the American Foundation for Suicide Prevention (YIG-727 0-015-13), the National Center for Advancing Translational Sciences (UL1TR002378, KL2TR002381), the National Institute of Neurological Disease and Stroke (R21NS104953, K08NS105929, R01NS088748, K02NS070960) and the National Institute of Mental Health (K01MH116364).